Revival KONAPUN!! Perhaps there were more women in 30's shouted for joy than actual children in Japan. KONAPUN KITCHEN series have just revived after 20 years with the strong desire from many adults who back then were kids and played with it. One of the image comes up to people's mind about Japan is its advanced technology. 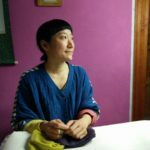 With China's recent growth, Japan is no longer the top of Asia and even having difficulty to rely on the brand name "Japan", but still Japan's technology has a good reputation. Japanese technology team doesn't cut corners even in kids' toys because this skill can develop when they are little. To be honest, as I spent most of the time as a tomboy and played baseball and football with boys more than playing house, I didn't even know about this toy. But this is not just a toy. 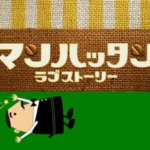 This is a technological experiment which educates Japanese kids without even knowing it. 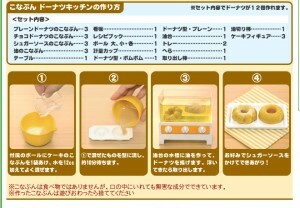 This is one of the series, "KONAPUN Doughnuts", available for 3,675 yen in Amazon Japan. This is the contents. All you need is KONAPUN powder and water. Mix them and pour into the mold and wait for 15 minutes, then mix KONAPUN fried oil and water. Insert the doughnuts into the oil. Strange, the bubble starts appearing as if it's really frying! When the doughnuts come up to the surface, it's cooked. At the end, mix KONAPUN sugar powder and water, pour over the doughnuts and done. Just so real. But why? What's the secret about frying doughnuts? 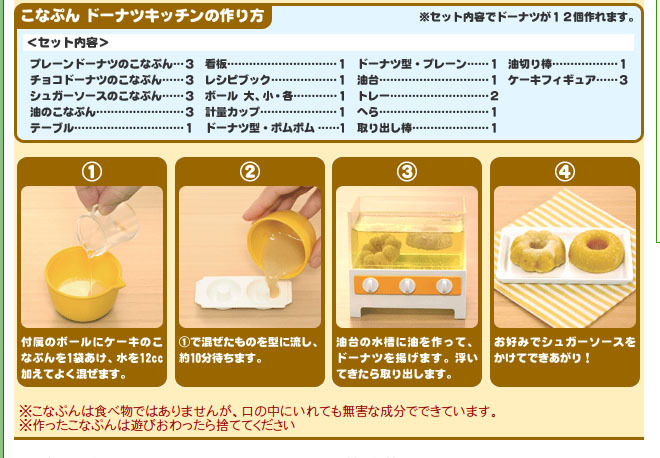 According to the producer of this toy, BANDAI, the base of this powder is citric acid and the acid reacts to the dough and fries it. The fundamental ingredient of KONAPUN is alginic acid which is extract of seeweed and is often used for gelatin type facial pack or pasta. This means, all the sweets you make are not edible but are child free products. 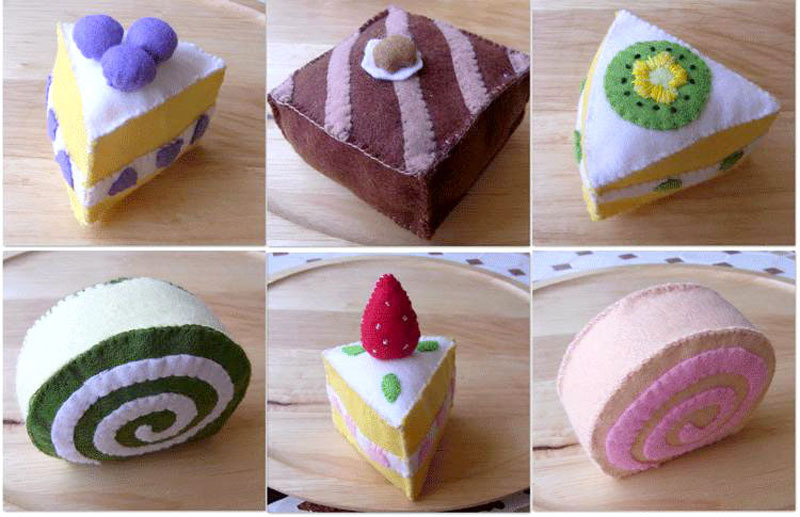 Also it doen't use any preservatives, so you can't keep them even though they look perfect sweet sample. 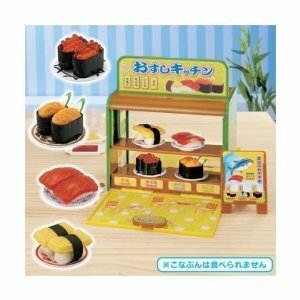 This is osushi kitchen, 5,600 yen in Amazon Japan. 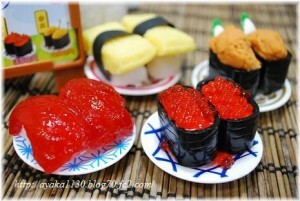 With this package you can make, salmon roe (IKURA), tuna, eggs and sea urchin (UNI). As you drop the salmon roe mixture into KONAPUN water, how curious, it changes into fish eggs. The rice is the same, you just "cook" the rice mixture in the KONAPUN rice cooker for 15 minutes. Look, it has the real rice texture. Look at these sushi. 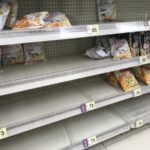 They are perfect food sample and it's a big shame that you can't keep them. Don't forget to take photos when you make one. 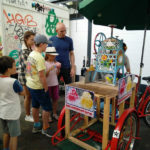 As you can see, Japanese kids are having contact with the technology in daily bases through play and develop their imagination without knowing it. 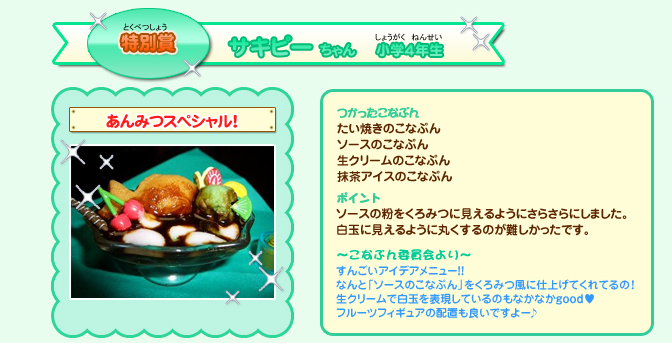 Those Japanese kids' who are not satisfied with just making them as the recipe says, there are competitions held. Repeat, these are not edible. Girls channel KONAPUN patissier contest was held since 2006. It seems like it has stopped at the moment. 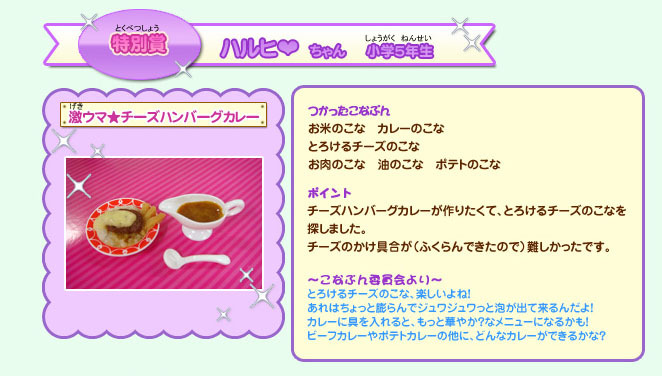 The 12th contest, special prize went to the 5th grade HARUHI's "super tasty cheese hamburger steak curry"
The 14th contest, special prize went to the 4th grade SAKIPIE's "special An-mitsu"
Brilliant creativity as little kids. Maybe they are the ones who will take over Japanese technology in the future. KONAPUN Kitchen series have variety of sweets and food and are available more than 10 series such as cookies, pizza, takoyaki (Japanese octupus balls) etc… as well as doughnuts and sushi. 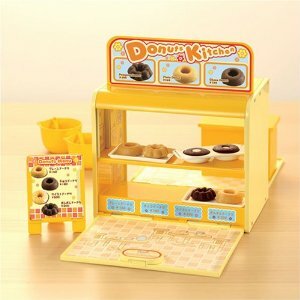 Kitchen series cost 2,000 yen to 5,000 yen but also refill packages are available for 700 yen to 1,000 yen. 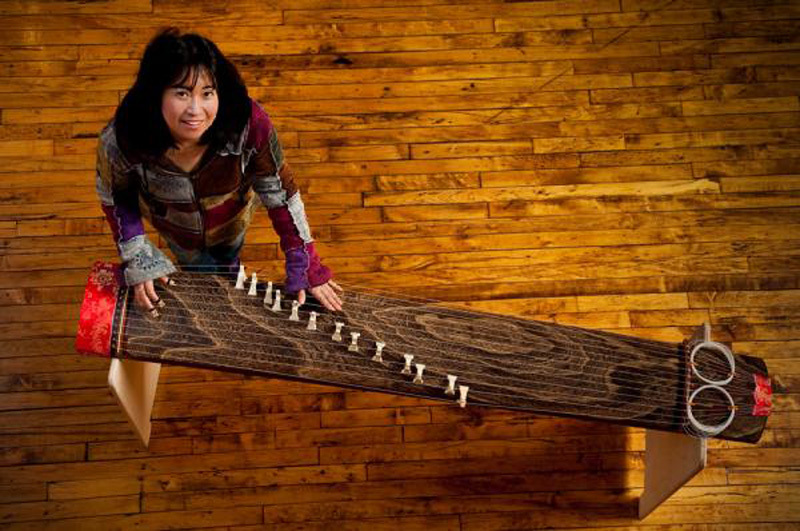 Mitsuko Uchida is one of the great classical Japanese pianists who just won the Grammy Award in 2011. On the night of the 13th of February, four Japanese musicians won at the 53th Grammy Award. This is historical. One of them is the guitarist, Takahiro Matsumoto from Japanese rock group B’z which has been one of the top group in Japan since the late 80’s. He won the grammy by collaborating with a master of guitar, Larry Carlton. Japanese people love ghost story. 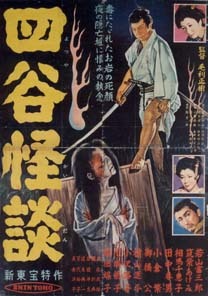 Traditionally there are many scary stories called Kaidan even for children such as Bancho Sara Yashiki and Yotsuya Kaidan. 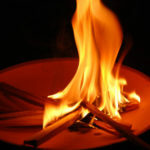 Usually they are stories about death, ghost and monsters which origin can dates back to 12th century. 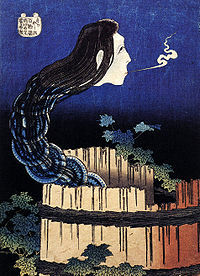 Ghost in Japanese is Obake or Yuurei, Obake means transformed figure and Yuurei means the soul of the death. By the way, do you know the main difference between Western ghost and Japanese one? 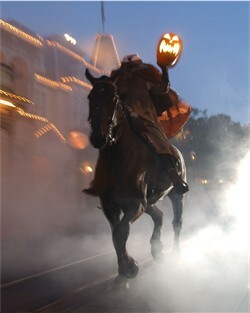 A typical image of Western ghost is headless as you might have seen in Tim Burton's Sleepy Hollow. Whereas typical Japanese Yuurei has no legs. Now recent Japanese horror films which have sent a shudder through not only Japan but Western world were Ring, One Missed Call or Dark Water, and all of these have been remade in the Hollywood. 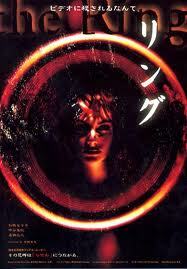 Japanese people some how love horror films. There are many TV programs talk about ghost and psychic phenomenon. And now, there is a new horror film coming out in Japan which made all Japanese horror fun shudder!! The film is Tomie Unlimited, it will be on screen in May and currently its trailer is showing all over Japan. However it's so terrifying that many of the cinemas have stopped showing it. If you are not big fan of horror film, skip the video please. So now, which do you scare more, Western horror or Japanese horror? Well for me the most makes me terrified is the look of the ghost. One vote for Japanese Yuurei brrr.